After 70 years, the Israeli-Palestinian conflict is still unresolved. The conflict simmers for a few years, then erupts again with new massacres and violence. This article describes recent events, the failure of the “two state solution” and need for a different approach. In the past couple months, Israeli Defence Force (IDF) soldiers have killed 118 Palestinian protesters and seriously wounded many thousands more. The protesters were unarmed and no threat to the soldiers. Gaza hospitals overflow with victims. In the wake of this violence, human rights groups filed a legal petition to make it unlawful for Israeli soldiers to fire on unarmed protesters. Last week the Israeli Supreme Court rejected the petition. From the end of March till May 25, Palestinians in Gaza protested against their oppression as close as they could get to the border fences. About 118 were killed and many thousands seriously injured by Israeli snipers. They were all shot inside Gaza. On May 27 – 28, the Israeli military launched tank mortars at Palestinian military outposts inside Gaza, killing four. Next day, on May 29, Palestinian militants launched unguided mortars into nearby Israel. Most of them fell harmlessly and there were no Israeli casualties. Next day, on May 30, Israeli jets and helicopters launched guided missiles and bombs on 65 different locations within Gaza. Pro Israel advocates wish to prevent people from seeing what is really happening. They know the potential damage if people see video such as Israeli snipers celebrating the shooting of unarmed protesters. To prevent this, a proposed law will make it illegal to photograph or video record Israeli soldiers. Palestinian journalists have condemned this attempt to criminalize journalism. Israel calls itself the “Startup Nation” because of the economic and technological achievements. But in Gaza and the West Bank, Israeli policies and actions strangle the economies and worsen living conditions. Palestinians in Gaza are kept separate from Palestinians in the West Bank. There is no trade, travel or inter-family visitation. This is in violation of international agreements including the Oslo Accords. The claim that Israel “departed” Gaza is false. Israel controls the borders, sky and waters around Gaza, a coastal strip just 5 miles wide by 25 miles in length. Unemployment in Gaza is approaching 50%, the highest unemployment in the world. Fisherman are prevented from going out into deeper waters and shot at when they go beyond Israel’s imposed zone. Gazan farmers cannot export independently. Israel frequently blocks the import and export of crops and products. It is almost impossible to leave Gaza. Even outstanding students winning international scholarships may have their exit denied. The electrical and water treatment facilities have been bombed and destroyed by Israel. Nearly all the drinking water is contaminated. Israel restricts the amount of food permitted to enter Gaza so there is continual shortage leading to nutritional deprivation, stunted growth and anemia. This situation is not new. Eighteen years ago, Israeli journalist Amira Hass described the history, the facts and statistics as well as her personal experience living in Gaza in the profound book “Drinking the Seat at Gaza: Days and Nights in a Land Under Siege”. The situation was extremely grim then but keeps getting worse. At the northern Gaza border, Israel is now building a “sea barrier” extending far out into the Mediterranean. It will be above and below the water line. A major reason for this expensive project is to block sewage and pollution from the waters in front of Gaza. Because of Israeli attacks on sewage treatment and electrical infrastructure, sewage flows into the sea. Last summer, Zikim Beach in southern Israel had to be closed due to the inflow of sewage from Gaza. The ‘sea barrier’ now in construction will block the sea currents. This will keep the Israeli beach clean and greatly compound the problem in Gaza. The strangulation, impoverishment and oppression is not confined to Gaza. In the West Bank, Israeli settlements continue to expand. This increases the number of check points, restrictions and repression. Travel from Bethlehem to Jerusalem is impossible for most Palestinians. The majority of West Bank water from the aquifers is transferred to Israel or provided cheaply to settlers while Palestinians must buy water and store it in tanks on their rooftops. In the last few years, Israel has made it increasingly difficult or impossible for humanitarian groups to provide medical support including breast cancer screening. A compelling new book titled “The Other Side of the Wall” describes the daily struggle in the West Bank where Palestinians and international allies protest against the theft of land, abuses, random killings and imprisonments. There seems to be a trend toward greater Palestinian unity and strategic agreement. The tens of thousands of Palestinians protesting in Gaza were unarmed and united behind the Palestinian flag rather than separate party or movement flags of Hamas, Islamic Jihad, PFLP, DFLP, etc.. The Palestinian protesters in Gaza show remarkable courage. Beginning on Friday March 30, they have returned week after week despite seeing thousands of their fellows shot and wounded or killed. In recent days, Gazans have again challenged the Israeli port blockade which prevents ships from departing or arriving. International solidarity with the Palestinian cause is also persistent. Three ships (two Swedish and one Norwegian) recently departed Scandinavia heading for the Mediterranean Sea and Gaza. 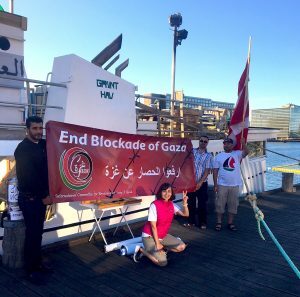 Named the 2018 Freedom Flotilla, the ships are carrying dozens of international citizens to again demand that Israel stop its blockade of Gaza. Despite the huge imbalance today, time may be on the side of the Palestinian cause. Systemic apartheid in South Africa existed for a long time and seemed strong. But ultimately it collapsed quickly. The same may unfold in Israel / Palestine. Today, South Africa is an important supporter of the Palestinian cause. South Africa was the first nation to recall its ambassador to protest the “indiscriminate and grave Israeli attack” in Gaza. Israel has the military might but Palestinian resistance and courage persists. 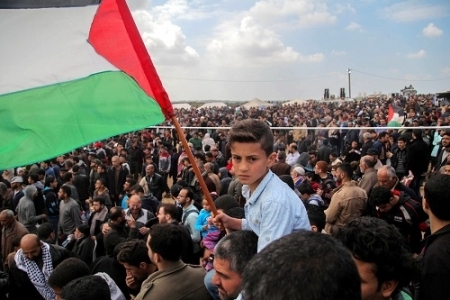 The Palestinian population is steadfast, persistent and growing. They have increasing number of allies who support their cause. Young American Jews are unlike their parents and increasingly critical of Israeli policies. Some courageous Israelis, such as Miko Peled, speak out unequivocally that Israeli apartheid must end and be replaced by one state with democracy and equality for all. A million registered Palestinian refugees live in Lebanon and Syria, patiently waiting. They have not forgotten their legal claim and right to return. The recent bloodshed and massacres underscore the fact that there is no solution on the current path. It only leads to increasingly unlivable conditions in Gaza plus more illegal settlements and oppression in the West Bank. The so-called “two state solution” has been dead for many years and should be forgotten. As happened in South Africa, the international community can and should help. It is time to increase international pressure and expand BDS (boycott, divestment and sanctions) against Israel to help bring a peaceful end to this conflict with its constant oppression and recurring massacres. Palestinian courage should spur international action.